A static mixer is a precision engineered device for the continuous mixing of fluid materials, without moving components. Normally the fluids to be mixed are liquid, but static mixers can also be used to mix gas streams, disperse gas into liquid or blend immiscible liquids. The energy needed for mixing comes from a loss in pressure as fluids flow through the static mixer. One design of static mixer is the plate-type mixer and another common device type consists of mixer elements contained in a cylindrical (tube) or squared housing. Mixer size can vary from about 6 mm to 6 meters diameter. Typical construction materials for static mixer components included stainless steel, polypropylene, Teflon, PVDF, PVC, CPVC and polyacetal. The latest design involve static mixing elements made of glass-lined steel. In the plate type design mixing is accomplished through intense turbulence in the flow. Flow division: In laminar flow, a processed material divides at the leading edge of each element of the mixer and follows the channels created by the element shape. At each succeeding element, the two channels are further divided, resulting in an exponential increase in stratification. The number of striations produced is 2n where 'n' is the number of elements in the mixer. 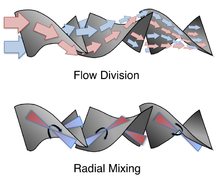 Radial mixing: In either turbulent flow or laminar flow, rotational circulation of a processed material around its own hydraulic center in each channel of the mixer causes radial mixing of the material. Processed material is intermixed to reduce or eliminate radial gradients in temperature, velocity and material composition. A common application is mixing nozzles for two-component adhesives (e.g., epoxy) and sealants (see Resin casting). Other applications include wastewater treatment and chemical processing. Static mixers can be used in the refinery and oil and gas markets as well, for example in bitumen processing or for desalting crude oil. In polymer production, static mixers can be used to facilitate polymerization reactions or for the admixing of liquid additives. The static mixer traces its origins to an invention for a mixing device filed on Nov. 29, 1965 by the Arthur D. Little Company. This device was the housed-elements type and was licensed to the Kenics Corporation and marketed as the Kenics Motionless Mixer. Today, the Kenics brand is owned by National Oilwell Varco. The plate type static mixer patent was issued on November 24, 1998 to Robert W. Glanville of Westfall Manufacturing; however, there are also other suppliers of static mixers, Fluitec Georg AG, including Sulzer Chemtech Ltd, Verdermix, Koflo Corporation, Statiflo, KOMAX Systems Inc., and MVV srl. ^ Paul, Edward L. (2004). Handbook of Industrial Mixing-Science and Practice. Hoboken NJ: John Wiley & Sons. pp. 399 section 7-3.1.4. ISBN 0471269190. ^ Albright, Lyle F. (2008). Albright's Chemical Engineering Handbook. Boca Raton FL: CRC Press. p. 682. ISBN 0824753623. ^ Gieseke, Thomas. "An Evaluation of the Hydrodynamics Mechanisms Which Drive the Performance of the Westfall Static Mixer". pp 28. US Naval Undersea Warfare Center and Westfall Manufacturing. Retrieved 19 May 2016. ^ Bor, Thomas P., "The Static Mixer as a Chemical Reactor", British Chemical Engineering, Vol. 16, No. 7, 1971. 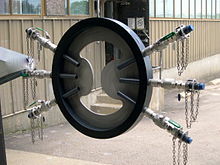 ^ "Westfall Variable Flow Static Mixer Enables Bitumen Pumping via Pipeline". Marketwire. December 4, 2012. ^ "Markets & Applications". Sulzer Chemtech. Archived from the original on 2012-06-30. Retrieved 2011-07-04. ^ Arons, Irv (2008-07-23). "ADL Chronicles: The Disposable "Motionless Mixer"". Adlittlechronicles.blogspot.com. Retrieved 2011-07-04. ^ U S Patent Office. "US Patent Static Mixer". This page was last edited on 27 June 2018, at 00:15 (UTC).